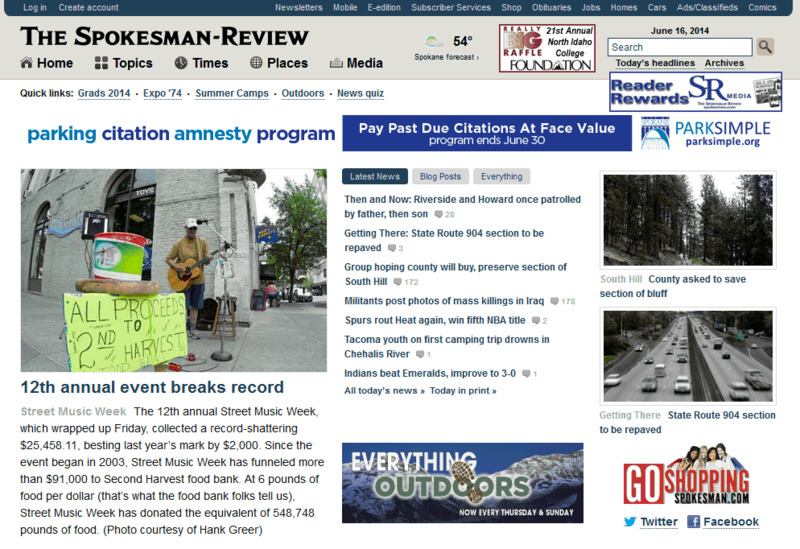 A couple days ago I happened to look at the Spokesman Review web site and saw a familiar looking photo. It was one I took during Street Music Week. I had posted all my photos on Facebook. I thought it was cool the Review used my photo and I appreciated that they attributed the photo to me, but I was curious as to why they used it without asking me. After a couple of back and forths, I received this from Alison Boggs, the online producer. In our Facebook post, to which you responded by posting your photo albums, it said that some of the information posted by people responding would be used online or in print. Ah, so that's it. I had posted a link to my photo album in the Review's post asking people to share their photos of Street Music Week. I went back to the Spokesman Review's Facebook page to have another look at the language in the post but it has disappeared from their news feed. Alison said they did not delete it. So how does it disappear? Next time I'll be sure to read the small print so I won't have to pester anyone with questions that could have been avoided had I read the small print.